Is modern society more humane? Why did the Church punish heretics? Why didn't they just leave them be like today? Does the Inquisition Still Exist? How many people were killed in the Inquisition? Warning: Graphic picture of a murdered human in this article. For a copy of the article without the picture email us, otherwise continue. There is not one Catholic alive today who participated in the Inquisition. They all died centuries ago. Every one of them had to face God. God knows the heart of every individual involved and justice has been served. We had no part in the Inquisitions, nor has any Catholic alive today. These incidents happened during one of the most brutal times in human history, which any medieval movie will confirm. It has become a theme that some Evangelicals pastors have repeatedly preached to their congregations about Catholics. The institution of the Inquisition has been abolished...the children of the Church cannot but return with a spirit of repentance to "the acquiescence given, especially in certain centuries, to intolerance and even the use of violence in the service of the truth". This spirit of repentance, it is clear, entails a firm determination to seek in the future ways to bear witness to the truth that are in keeping with the Gospel." "Lord, God of all men and women, in certain periods of history, Christians have at times given in to [forms of] intolerance and have not been faithful to the great commandment of love, sullying in this way the face of the Church, your Spouse. Have mercy on your sinful children and accept our resolve to seek and promote truth in the gentleness of charity, in the firm knowledge that truth can prevail only in virtue of truth itself. We ask this through Christ Our Lord." The Inquisition tortures and deaths were wrong, dead wrong! The criticisms we find today about the Inquisition put Catholics in a difficult position. There are incredible exaggerations floating around in the secular media and among Evangelicals, yet if a Catholic corrects the exaggerations then he is accused of making excuses for the Inquisition. One of the drawbacks of being 2000 years old is that there are incidents throughout history that people can point at and hold against the Catholic Church. We expect that two thousand years from now, if the Evangelical Church remains (and if the Lord hasn't come back yet), there may be some shameful bits of history that people who want to criticize the Evangelical Church will be able to seize upon. For instance, many Evangelical/Baptist Christians defended and participated in the slave trade which was responsible for thousands of beatings, tortures and deaths on slave ships. They did this with Bible in hand. The Vatican (Catholic Church) always condemned the slave trade. By the end of the Inquisition, the Reformation was in full swing. The followers of Martin Luther, Calvin, the Church of England, other Protestant Churches and their followers were quoting Scripture while advocating the burning of witches throughout England, Scotland, America, Germany and elsewhere. From the years 1305-1750 A.D. there were 52 Popes. Of all of them, only two are being considered for Canonization by the Church: Blessed Urban V (1362-70) and Blessed Innocent XI (1676-89). Compare that with other periods of history where every century provided two or three Saints from among the Popes. This gives us a bit of a sense that it was a dark time in history. Is modern society more humane than medieval society? In several hundred years, if civilization survives, it may look at the barbaric treatment of children in the wombs of their parents as one of the most inhumane acts in the history of civilization. 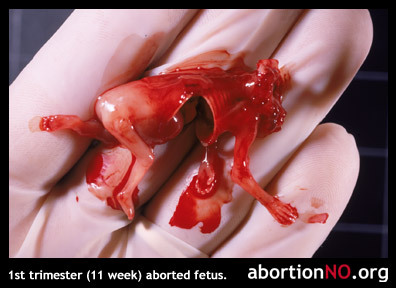 Today, the most dangerous place on the planet is in a mother's womb. Modern society has a lot of housekeeping to do before it proclaims itself to be the moral compass of history. In a way, it appears that the Catholic Church is making amends for the atrocities of the Inquisition. It is a united voice attempting to stop this holocaust of unborn babies. Why did the Church punish heretics? Why didn't they just leave them be? When Jesus sent his apostles and disciples out to convert the nations to Christianity, this is what he said to do to people who did not want it (Luke 9:1-6; 10:8-12). Yes, that is what Jesus said to do to people who were not yet Christians and who did not belong to the Church. Yet, look at what He and the Apostles said and did to people who were already in the Church yet who taught or acted contrary to it: Matt 7:15-20, Matt 17:17-18, Matt 18:6-9, 1 Corinth 5:5, 1 Tim 1:19-20, Titus 1:10-11, etc. Jesus said "...from those who have been given much, much will be required." Also, a heretic does not merely victimize his own soul, but the souls of the "little ones" around him, whom he is leading astray (see again, Matt 18:6-9). This is why the Church acted. It exposed the heretic for what he was. If someone went out into your street and started shooting people, including your kids, you wouldn’t say, "let him go ahead and do it, people can protect themselves...it's their own fault if they are shot to death." The Church was very worried that people who were influenced by these heresies were going to spend eternity in hell. Common people of the middle ages had no intellectual defense with which they could make a reasonable judgment about the Truth. They were almost as vulnerable to the heresies that were sweeping through communities as a person standing in front of a gun is today. Except a lot more than their lives was at stake, their eternal lives were in jeopardy. During the Inquisition, no one was punished for simply believing a heresy. The crime was teaching it, and leading others astray. The Church felt it was their job to protect the souls of the innocent. In hindsight, the Church understands that it would have done better by not using force, which is why Pope John Paul II made his apology in 2000. During 900-1000 AD the Germanic tribes ran Europe and it was a very dark and violent period. There were virtually no heresies because there was no education and very little communication. Germanic law displaced the Roman law of several centuries earlier. Christianity was trying to convert the Germanic tribes and they had no help from the authorities. The Germanic law was actually quite a bit more barbaric than the ancient Roman law. Germanic law basically said, "If you have a beef with a person, or group of people, fight it out and God will choose the winner." The Germanic law was very violent. Those of us who have seen movies about the middle ages are well aware of how violent it was. It was a different reality. Of course modern "all star wrestling" and reality TV shows with live murders aren't much better. But somehow we justify violence today. "There never was such a thing as a Church-wide inquisition, a terrifying monolith comparable to the NKVD or the Gestapo. It is more accurate to think of inquisitions that operated extensively in some areas in a highly decentralized way, although they notionally acted under papal authority. Inquisitions were important at certain times and places but never existed in other areas." "The main problem about speaking of 'the Inquisition' is that it suggests that religious repression of this sort was a Catholic prerogative. In fact, before the Enlightenment, virtually all religious traditions on occasion acted similarly when they had the power to do so..This indictment of religious savagery and intolerance applies to all the Protestant nations, even relatively liberal ones such as England and the Netherlands. Equally blameworthy would be Muslims, Hindus, and even Buddhists. After all, in the seventeenth century, when Catholic inquisitions were at their height, the Buddhist/Shinto nation of Japan was engaged in a ferocious attempt to stamp out the deviant faith of Christianity through torture and massacre. In just forty years, these Japanese religious persecutions killed far more victims than the Spanish Inquisition would in all the centuries of its existence." People thought differently in those days. Human rights, freedom of conscience, religious freedom and pluralism were concepts that grew out of experience and maturity of society and through doctrinal maturity. These concepts did not come into being until the last hundred years or so. It was as a result of all of the wars of the middle ages, that Catholic theologians studied and developed the concept of human rights which was picked up by enlightenment thinkers in the 18 century and has advanced to what we know now. Public order was understood differently than today. Christianity of the time was a political religious system. Theologians of the time thought that society should be ordered in unison with local authorities. The Church and State banded together. Attempts to corrupt Christianity were considered treason to the state. It was like the Moslem countries of today (i.e., Turkey, Indonesia). Christianity broke out of that head space several hundred years after the Middle Ages, but it took a long time. Ironically, today the State is beginning to silence the Church on things like homosexual marriage. Things have turned 180 degrees and Christianity has become more and more an underground society. An "Inquisition" is a legal inquiry. Historically there were three major Catholic Inquisitions. The Medieval Inquisition started around 1184 in response to the appearance of popular heretical movements throughout Europe, in particular Catharism and Waldensians in southern France and northern Italy. In 1478 Pope Sixtus IV reluctantly authorized the Spanish Inquisition under pressure from King Ferdinand of Aragon. Initially it investigated charges against Jewish and Muslim converts to Christianity of secretly practicing their former religions. It acted under the control of the kings of Spain. The early excesses of the Spanish Inquisition were condemned by Popes Sixtus IV, Leo X, Paul III and Paul IV. The Roman Inquisition began in 1542 when Pope Paul III established the Holy Office as the final court of appeal in trials of heresy and served as an important part of the Counter-Reformation. It was tightly controlled by strict procedural rules but was made infamous by the trial of Galileo. More on why the Church is so slow to change here. Most Evangelical congregations have councils to protect their vision and Statement of Faith. In medieval times Protestant Church councils often performed "inquisitions" where there was torture. (more on that below). Today these Evangelical councils do not do that at all. They simply try to promote and protect their vision. Just as most Evangelical congregations have councils to protect their vision and statement of faith, the Inquisition as an institution still functions in the Vatican as the Congregation for the Doctrine of the Faith. Today of course it has nothing to do with torture. Although the Church still does reserve the right to ask people to leave if they are spreading information contrary to the Church's teaching. Every Evangelical institution also has a similar mechanism (formal or informal). Just try walking into an Evangelical church and hand out Rosary pamphlets. You will quickly be ushered out. The duty proper to the Congregation for the Doctrine of the Faith is to promote and safeguard the doctrine on the faith and morals throughout the Catholic world: for this reason everything which in any way touches such matter falls within its competence. The congregation is now headed by Prefect Cardinal Joseph Ratzinger, ...a staff of 33, and 25 members - cardinals, archbishops and bishops - and 28 consulters. Given the nature of its task, congregation work is divided into four distinct sections: the doctrinal office, the disciplinary office, the matrimonial office and that for priests. The Church believes it was granted teaching authority (Magisterium) by Christ. (Mat 16:18-19, 18:18, 28:20; Jn 14:16, 25, 16:13) What she teaches, she defends; whom she has accepted through baptism, she teaches, nurtures and occasionally chastises. (Eph 6:4) In order to defend the flock, the Church grants any believer the right and duty to report heresy, whereupon there can be a formal investigation and inquiry (hence the word inquisition). Inquisition allows the accused heretic to present his case and to hear the Church's doctrine on the matter, all for the purpose of bringing the Catholic back into alignment with the teachings of the Church that he/she claims to be a part of; if he/she refuses to recant, the Church may refuse the heretic the Sacraments because that individual has rejected the Magisterium. What we now reject is the idea of imposing pain, suffering or death as punishment for heresy or to extract a confession - that is what JPII says we must "never again" allow. In 1208, there was the "Cathars" heresy in southern France. The teachers of this heresy abandoned their Christian faith for multi-gods, good gods and bad gods. Those of us who are Christian can understand the concern of the Church. We want to cry every time about what the New Age is doing to North American Christianity. The Cathars had a disdain for scientific innovation and were a serious stumbling block to economic development in the region. The northern Lords also had a bone to pick with the Lords of southern France who were harbouring the heresy. They wanted to assert their authority and expand their empire. They felt that religious unity was the only way to maintain the political unity of a country. They were wrong. This was 700 years before today's religious pluralism. The Cathars were waging war on Christians and many were killed in southern France. A legate to the Pope was sent to southern France to assess the situation with the Cathar heresy. The Cathars made the mistake of killing him. The Pope talked to the King in northern France and asked what could be done. The King launched a crusade in 1209 that destroyed the Cathar's military might in southern France. It was a brutal invasion where many men women and children died, about 6,000. The Cathars went underground and continued to pull many from the Faith. The first Inquisition was instituted in 1231 as a response to the Cathars influence in southern France. An Inquisition consisted of two religious judges who would go into an area where a heresy was being spread. They would interview people and find out who was propagating the heresy. Then they would contact the heretics, and give them a grace period of 48 hours to cease their teaching and retract. After that time, if the heretic didn't stop, they would hold court. At this session the two inquisitors would be present, along with the Lord of the region, and some community leaders etc. They would bring forth evidence and seek a confession. Then the heretic would be handed over to the local authorities. Under Roman law, an offense against the faith was considered an offense against the state, so the state would do the discipline. The Church only passed the verdict, not the sentence. The Inquisition could not have happened without collaboration and alliance with the civil power of the time. The Inquisition was also an attempt to stop Catholic lynch mobs that went around punishing heretics. If the Church didn't step in, the Catholic lay people would gather together in search of heretics and they sometimes got the wrong guy. It was a mess. These mobs would go around doing violence to people who were teaching heresy. For example, a Cathar preacher made a bonfire and drew a large crowd. He preached against Jesus and threw a crucifix on the bonfire. This enraged the townsfolk and they rushed the Cathar preacher and threw him on the bonfire. Today, in our culture, people speak out against Christianity all the time in public (media) and do the equivalent of burning crosses. We stand silent. Perhaps there is a medium ground between burning someone (middle ages) and standing in silence (now) as critics tear apart the Faith. Strange as it may seem, in a very wrong way, the Inquisition brought some order to communities who were glad to see the Inquisitors because it meant that lynch mobs stopped. The Inquisition was actually much more civilized than the uncontrolled lynch mobs. Another thing that is exaggerated by the press is the use of "torture" Footnote 3 to bring about a confession. Torture was never used more than once on an accused and it was quite rare among Church inquisitors. Secular Inquisitors on the other hand were quite harsh. Torture was a standard practice in the secular courts of the time. There are stories of secular criminals "convicting themselves" of heresy so they could be moved from the harsh secular prisons to the Inquisition prisons that had better food and better living conditions. Most Inquisition convictions of the time ended in jail terms. Although it was a life term, the prisoners usually got out after 1-2 years because the prison would become full. The prisoners would often be set free and would return to jail only to sleep. Despite popular belief, executions were not very common. The inquisition was never used as a way to "force people to convert" to Christianity, but rather it was a way to deal with heresy that was being taught by baptised Christians. In general, "forced conversion" was not the way that the Church evangelized, even though other religions of the time used forced conversion, and still do. Christians of the Middle Ages were genuinely afraid that souls were going to go to hell if they were lured from Christianity. They thought it was worth it that some teachers of heresy died so that thousands would not be led astray by heretics who were preaching and drawing many from Christianity towards an eternity of darkness. Unfortunately, they were wrong. The ends does NOT justify the means. Lord forgive us. The medieval Inquisition flushed out the Cathar heresy. It is where we got the word "Catharsis". This section is based on excerpts from the paper: The Real Inquisition, Investigating the popular myth by professor Thomas F. Madden with footnotes by Fr. Lindsay Harrison. By the mid 16th century, Spain was the wealthiest and most powerful country in Europe. Europe's Protestant areas, including the Netherlands, northern Germany, and England, may not have been as militarily mighty, but they did have a potent new weapon: the printing press. Although the Spanish defeated Protestants on the battlefield, they would lose the propaganda war. These were the years when the famous "Black Legend" of Spain was forged. The "The Black Legend," did not arise until after the Protestant defeat at the Battle of Muhlberg at the hands of Ferdinand's grandson, the Emperor Charles V. A fierce propaganda campaign ensued. Two important Protestant publications in it were John Foxe's Book of Martyrs (1554) and a leaflet published in 1567 penned by a supposed Inquisition victim named Montanus. He painted Catholic Spaniards as barbarians who ravished women and sodomized young boys. The propagandists soon created "hooded fiends" who tortured their victims in horrible devices like the knife-filled Iron Maiden. The number of victims was exaggerated. Foxe claimed 32,000 were burned at the stake. The myth became the accepted stereotype, as seen in Dostoyevsky's Grand Inquisitor in The Brothers Karamazov and in Edgar Allan Poe's tale of The Pit and the Pendulum. Innumerable books and pamphlets poured from northern presses accusing the Spanish Empire of inhuman depravity and horrible atrocities in the New World. Opulent Spain was cast as a place of darkness, ignorance, and evil. Protestant tracts that took aim at the Spanish Inquisition drew liberally from the Black Legend. But it had other sources as well. From the beginning of the Reformation, Protestants had difficulty explaining the 15-century gap between Christ's institution of His Church and the founding of the Protestant churches. Catholics pointed out this problem, accusing Protestants of having created a new church separate from that of Christ. Protestants countered that their church was the one created by Christ, but that it had been forced underground by the Catholic Church. Thus, just as the Roman Empire had persecuted Christians, so its successor, the Roman Catholic Church, continued to persecute them throughout the Middle Ages. Inconveniently, there were no Protestants in the Middle Ages, yet Protestant authors found them there anyway in the guise of various medieval heretics. In this light, the medieval Inquisition was nothing more than an attempt to crush the hidden, true church. The Spanish Inquisition, still active and extremely efficient at keeping Protestants out of Spain, was for Protestant writers merely the latest version of this persecution. Mix liberally with the Black Legend and you have everything you need to produce tract after tract about the hideous and cruel Spanish Inquisition. And so they did. In time, Spain's empire would fade away. Wealth and power shifted to the north, in particular to France and England. By the late 17th century new ideas of religious tolerance were bubbling across the coffeehouses and salons of Europe. Inquisitions, both Catholic and Protestant, withered. The Spanish stubbornly held on to theirs, and for that they were ridiculed. French philosophers like Voltaire saw in Spain a model of the Middle Ages: weak, barbaric, superstitious. The Spanish Inquisition, already established as a bloodthirsty tool of religious persecution, was derided by Enlightenment thinkers as a brutal weapon of intolerance and ignorance. A new, fictional Spanish Inquisition had been constructed, designed by the enemies of Spain and the Catholic Church. According to public news reports the book's editor, Prof. Agostino Borromeo, stated that about 125,000 persons were investigated by the Spanish Inquisition, of which 1.8% were executed (2,250 people). Most of these deaths occurred in the first decade and a half of the Inquisition's 350 year history. In Portugal of the 13,000 tried in the 16th and early 17th century 5.7% were said to have been condemned to death. News articles did not report if Portugal's higher percentage included those sentenced to death in effigy (i.e. an image burnt instead of the actual person). For example, historian Gustav Henningsen reported that statistical tabulations of 50,000 recorded cases tried by nineteen Spanish tribunals between 1540-1700 found 775 people (1.7%) were actually executed while another 700 (1.4%) were sentenced to death in effigy ("El 'banco de datos' del Santo Oficio: Las relaciones de causas de la Inquisicion espanola, 1550-1700", BRAH, 174, 1977). Jewish historian Steven Katz remarked on the Medieval Inquisition that "in its entirety, the thirteenth and fourteenth century Inquisition put very few people to death and sent few people to prison; 90 percent of its sentences were canonical penances" (The Holocaust in Historical Context, 1994). During the high point of the Spanish Inquisition from 1478-1530 AD, scholars found that approximately 1,500-2,000 people were found guilty. From that point forward, there are exact records available of all "guilty" sentences which amounted to 775 executions. In the full 200 years of the Spanish Inquisition, less than 1% of the population had any contact with it, people outside of the major cities didn't even know about it. The Inquisition was not applied to Jews or Moslems, unless they were baptised as Christians. If we add the figures, we find that the entire Inquisition of 500 years, caused about 6,000 deaths. These atrocities are completely inexcusable. These numbers are however, a far cry from the those used in the popular press by people who are always looking to destroy the Church. This is about 20% of the number of war related deaths that have occurred in Afghanistan and Iraq in the 2 years since the US responded to 9/11. Another thing to note is that the Spanish Inquisition, in a wrong way, may have saved some lives. In many European countries in the 16th century, religious wars were the cause of tens of thousands of deaths. But in Spain, there was political and religious unity as a result of the Inquisition, and there was no such war. Nevertheless, the Inquisition tortures and death were inexcusable. We echo the voice of John Paul II, "Forgive us Lord, Never Again". Millions of women were murdered during the 300 years of Inquisition. Your site lies disastrously on this fundamental point. Jerk. This is characteristic of the anger that the modern popular media has generated against the Church. We wrote back to this woman asking her what reputable historian she is citing. There was no response. The National Film Board produced a movie about 10 years back called "The Burning Times", which gave birth to the popular myth that the Inquisition was responsible for 9 million witch burnings in the middle ages. Jenny Gibbons, a self-professed wiccan practitioner and wiccan historian, has written a very interesting article posted on a pagan web site called "Covenant of the Goddess." She has a Masters in medieval history and minored in the Great Hunt. Her views about the nature of God and his plan for humans is completely different from my Catholic views, but we have a great respect for the integrity with which she reveals the truth about the Burning Times to her wiccan associates. Jenny's academic integrity would not let her skew her findings because of her pagan beliefs. In places where the Inquisition was the strongest there were the fewest numbers of witch burnings. For example, in Spain there were very few witch burnings, which was also true for Italy. Before looking at numbers, It is important to understand that almost everyone back then believed in witchcraft. They believed witches were causing death and destruction. The educated theologians at the time scoffed at it, but the common people felt that someone practicing witchcraft was as dangerous to society as a serial murderer. People didn't know what caused the black plague, or the whooping cough which would kill infants in 2 weeks. People were looking for answers, sort of like modern society when it thinks unwanted babies (overpopulation) are the cause of our problems, so we murder them in the womb. Science was not developed. Of witches who died, 95% were tried by secular tribunals rather than the Inquisition or Episcopal courts. Two inquisitors put out a manual called "Malleus Maleficarum" (the hammer of witches) in an attempt to squash witchcraft in Germany, but the Bishops stopped them, and they didn't get very far. The book however was a very unfortunate piece of work. The secular courts got hold of this manual and used it to prosecute witches. Although the inquisition did put witches on trial, witch prosecutions were scattered and the Inquisition itself was responsible for less than 1000 deaths to witches. The main witch crazes were between 1580-1685 A.D. The reform was in full swing by then. The Catholic Church had nothing to do with the Salem witch burnings in the US. That was a Protestant thing, as were witch burnings in Scotland, England, most of Germany. There were also many secular entities that burned witches. Often overlooked is that 20-25% of witch prosecution were men. The Encyclopedia of Witchcraft and Demonology by Rossel Hope Robbins (New York : Julian Press, Inc., 1958. Encyclopedia Britannica. Third Edition, 1970) has been a major influence on modern thinking about witches and the Inquisition. It predates the 1972 secular discovery that the "historical" book by Lamothe-Langon called "Histoire de l'Inquisition en France" documenting the Inquisition in France, was a forgery. I've posted more information about that, from a secular "pagan" historian, here. Although there were witches on trial during the Inquisition, there was no major "witch craze" before the Reformation. Martin Luther, Calvin and their followers cited the Bible as their reason for wanting witches burned. At any rate, it was a dark time for all of Christendom, Catholic and Protestant. It has been the cause of many people falling away from Christ. The Pope is right when he says the children of the Church must look upon that period with a spirit of repentance. We have posted more information on witches during the inquisition here. The tortures and deaths of the Inquisition are inexcusable and the Church has paid a high price for it. The Church has been punished and is still being punished. Early reformers fueled much of their Reform movement by publicizing, and sometimes exaggerating, the injustices of the Spanish Inquisition. What many Evangelicals don't know is that there was also a Protestant Inquisition after the Reform. Protestants also fell into a similar myopic approach to silencing dissenting views. It was not a "warm fuzzy" Holy Spirit environment back in the early days of the Reform. Tens of thousands of non-Anglicans were killed in England. It was brutal. In America, the Puritans (Protestants) also conducted an Inquisition where people were burned at the stake. In Scotland in 1699, an 18 year old, Thomas Akin was hung (put to death) by the local authorities who were Presbyterians. The charge was blasphemy. We must be very careful when we look at history, to understand the thinking and the context of incidents. We don't think Churches that have sprung up in the last hundred years can claim complete amnesty from these matters even though they weren't around in Medieval times and during the violent years of the Reform. In the early days of the Inquisition (1231 AD was the First Inquisition) there was only one Church in Europe, the Catholic Church. That's where we all come from historically. Evangelicals would not have a Bible today if the Vatican had not guarded the original documents over those years. The things that Catholicism did to protect the faith in those days are part of the reason we are able to have Scripture in modern Evangelical denominations. We must remember that historical context is difficult to understand for those who were not there. The Church is on a pilgrimage. We are in no way trying to justify the Inquisition here. We simply want to dispel some myths. We hope this has been helpful. We pray that our Evangelical brothers will join us in our defense of the unborn. These crimes against humanity are occurring today in the name of progress. Will you join us in our fight against abortion. We need your help. Our prayer is that we will "Love one another" and forgive one another. May we go forward from here in the light of Christ. The research in this article is based on a talk given by Robert Sangenis, and the writings of Fr. Lindsay Harrison and professor Thomas F. Madden. The use of torture elicits revulsion from us today. Without condoning its use we may still seek to understand why inquisitions sometimes resorted to it. Our tendency is to assume that it was out of sadistic cruelty and a lack of respect for truth or justice. Actually it may have arisen for the exact opposite reason - a very high regard for justice manifested in a desire to protect innocent persons from wrongful conviction for serious crimes, especially considering the severity of the punishments. Legal historian John Langbein argues in his seminal work, Torture and the Law of Proof (1977), that in a "valiant effort to exclude completely the possibility of mistaken conviction," courts in 13th to 18th century Europe developed a system of proof in which only a confession or the testimony of two eyewitnesses was sufficient to convict in cases of serious crime. In so doing, they set the level of proof too high and, unable to obtain convictions in most cases, were forced to create a separate system in which physical torture was used to elicit confessions. The trouble was that "the innocent might" - and did - "yield to the pain and torment and confess [to] things that they never did." In the early Middle Ages a common means used to ascertain certain guilt before punishing an accused for a serious offense was Trial by Ordeal. An example is ordeal by hot iron. The accused grasped a red-hot rod and carried it a fixed distance. The burn was then bound and inspected in three days. If it was healing, God had shown that the person was innocent. If it had begun to fester, then he was guilty. Divine intervention was being sought to settle matters. In 1215 the Fourth Lateran Council forbade clergy from administering ordeals, striking a blow to its legitimacy. It was replaced on the continent by ancient Roman law. Instead of ordeals Roman Law relied on material evidence, confession or two eyewitnesses of good standing as sufficient proof in capital offenses. Material or circumstantial evidence, however, was not considered sufficient proof in medieval courts since judges wanted to be absolutely certain before convicting (we now accept "beyond reasonable doubt"). The problem was one did not always have two good eyewitnesses or a freely given confession. Other than dismissing charges altogether the only other solution appeared to be accepting some circumstantial evidence or one eye-witness, not as a "full-proof" but as a "half-proof" --- not sufficient to convict but enough to warrant further investigation. Testimony then had to come from the accused himself. Since "half-proofs" indicated possible guilt the use of torture was considered justified to settle the matter. As a safeguard against false confessions wrought under torture the investigators were to seek details of the crime that "no innocent could know." The accused had to repeat his confession after recovering and then again in court. Even if he later retracted his confession he was not supposed to be questioned under torture again. These safeguards, however, could be circumvented or abused. "For all its evils," Langbein reminds us, "torture was employed in aid of a rational as opposed to a ritual mode of proof. The use of torture presupposed a legal system that wanted to base judgment on the truth and thought it feasible to get the truth in part by means of regulated coercion." A different alternative to Trial by Ordeal was developed in England: Trial by Jury. English common law forbade torture in criminal cases unless with permission of the Privy Council (effectively meaning only for treason). However, if a person refused to enter a plea peine forte et dure (pressing with progressively larger stones) was used to coerce a plea. The continental supporters of torture considered their system more "rational" than juries. "The English substitute" observers Langbein, "retained something of the 'inscrutability' of the ordeals." Jurors were not professionals like judges or inquisitors so might be easily swayed or may act with partiality (initially juries included both accusers and witnesses). What eventually brought about the slow demise of judicial torture, according to Langbein, was not enlightened criticism of the system (its shortcomings had long been known) but modification of the Law of Proof that allowed for greater judicial discretion. Certitude as to guilt or innocence was no longer expected. This meant that convictions did not invariably require eyewitnesses or confession. The article originally appeared in the The Pomegranate, the New Journal of Neo-pagan Studies. Lammas 1998.